Well it most certainly does me! And I need help! Several years ago I started a challenge with a private online group that worked. It was different because it was designed to complete not only UFOs (unfinished objects) but also NewFOs (Newly founded objects). The plan is to determine what your new projects will be for the upcoming year in addition to the unfinished ones. So here is a project to bloom what you have started and and will begin! Anyone interested in participating? If so this is how it will work. Make a list of your UFOs that you desire to finish in 2014. Give your projects titles. Make a list of your NewFOs that you want to complete in 2014. Give your projects titles. Send me a copy of your lists by January 31 extended to February 28th. That will give you time to think and plan. I have created mine and it can be seen here. Yes my lists are quite long to assure anything I possibly would like to complete in the upcoming year is listed. I may complete all of them but then again I may not. I see this as goal setting! Anything that has been written down will most likely get completed because the list will become your primary focus without hindering your desire to create new. Having been following this challenge for several years it has also assisted in purchasing fabric for only my listed projects. In other words it saves on your budget!! Comment below letting me know that you are interested. At the end of each month create a post message of all projects completed and link up. When writing about your projects make sure you call it by the title you have given your project. I will send an email reminder monthly so please make sure I have yours. This email reminder will have a link to a blog post with the opportunity to link up or just to make comments on your progress. Linking up will serve to share and motivate each other. So make sure you comment on at least 2 individuals participating. It isn't a requirement to link up every month but every project completed must be shown on a post message sometime during the 11 months of the project. Ideally you will post monthly but sometimes life happens or other events prevents us to have a finish. I raise my hand here because I know this to be true for me. At the beginning of 2015 there will be two giveaways. One will be for the most UFOs completed and the other for the most NewFOs completed. The biggest prize will be all of our completions. Is this your year to bloom? Can they be any type of project? I would love to do some paintings and improvements to my home too! Admittedly I was thinking more in terms of needlework. I would prefer to keep to that Debra. Thanks for inquiring. Great idea Joanie, we all seem to have quite a few UFOs! Thanks for sharing. This sounds interesting...I have several UFOs and this year they might just get finished! I take part in a linkup called TGIFF (thank goodness it's finished Friday). I barely get anything done so rarely post. This project will make sure that I have posts to link up there too! I have some UFO finish goals anyway, so why not join. I am in. I will work to get a list together by tomorrow. 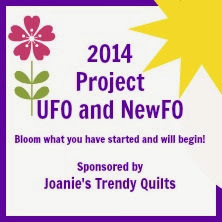 Sorry Joanie, I could not see your email, but here is a link to my blogpost with my UFO/NewFo goals for 2014. I can also be found at atticw@hotmail.com. Joanie, I'm interested in joining, especially since you extended the date to Feb 28th! Let me know what I need to do to participate. Hi Joanie! I just found your blog and interested to join. I'll send the list soon. Hope I'm not that late.